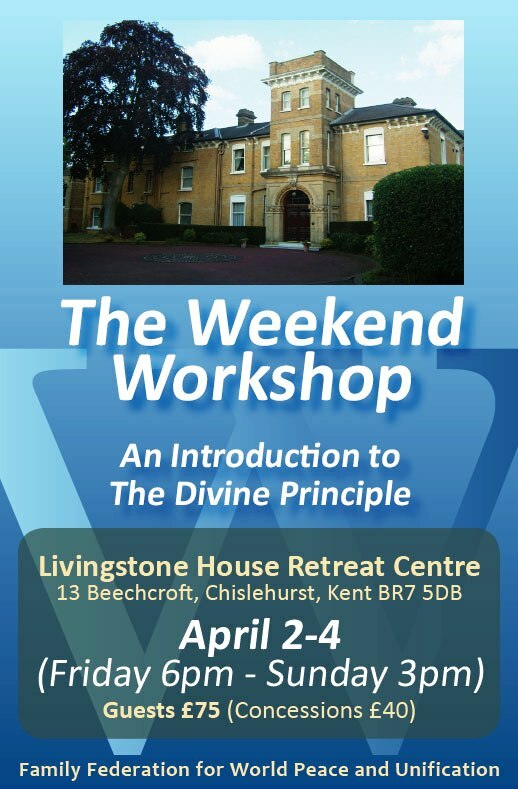 If you've been to one before this will probably be the best Divine Principle Introduction Weekend Workshop you will have attended to date. Taught by Mr. William Haines, in his own inimitable style, it's not to be missed. If you have never heard the whole of the Divine Principle this workshop will not only give you a good overview, but also lot's of background stories from the Bible, Torah and Koran. If you have not heard William teach before come and take this opportunity. You will be Glad that you did. We will start on Friday Evening with and meal and orientation. Saturday will have an early morning start with a morning services at 6 am (earlier for those who wish) and Breakfast at 7 am. We will finish early (3 pm) on Sunday to allow you to get home. What's in-between will be infinity in a day and eternity in your hand. If you play a musical instrument bring it if not just bring yourself. For more information contact Jeff Bateman.